Generally you will know you have an ant infestation simply by the increasing volume of ants in a particular part of your garden. The less obvious signs include piles of fine soil (particularly noticeable on lawns), which indicate that there a nest below them, and the wilting of plants which have had their roots disturbed by tunnelling ants. You may also find that seeds fail (because the ants have stolen them) and pot plants in glasshouses have been eaten. It will generally be quite easy to find the ant’s nest nearby to confirm the cause of the problem. An ant colony is mainly made up of wingless, sterile, female ‘worker’ ants and at least one fertile, female ant (the ‘queen’). The worker ants create the structure of the next, tend eggs, look after the resulting larvae, find food and protect the nest from invaders. At certain times of the year (usually in warm summer weather) the colony also produces winged male and winged, fertile female ants, which swarm in mating flights. After mating the males die and the pregnant females bite off their wings (as they are no longer needed) and either return to their existing nest, or form a new one, as a queen ant. They then lay their eggs in a ‘brood chamber’ within the nest. These hatch into largely immobile larvae which are fed a liquid food secreted by the worker ants. The larvae then pupate before emerging as adults. Queen ants remain active for several years and sustain the colony by continuing to lay eggs throughout their lifetime. On the whole ants are more of a problem to people than to plants. Where they do cause problems, these vary depending on the species of ant and the growing situation. Outdoors, ants will occasionally eat small pieces from plant leaves but rarely do much damage, although pot plants in glasshouses can be quite severely affected. Some species will also harvest parts of plants which have fungi growing on them, in order to continue to cultivate the fungi in their nest. Ants collect seeds to feed their larvae and you may find that damage has been done by ants takings seeds from seed trays, pots and open ground. They prefer seeds with a high oil content, so buddlejas, meconopsis, primulas, rhododendrons and violas are particular favourites. The process of creating an nest can also cause problems in the garden. Ants will tunnel to create the nest, which can disturb the growth of plant roots. In light or dry soil this disruption can lead to plants wilting and dying. Soil is piled up over the nest which, when ants have been digging in a lawn, can cause patches of grass to die and make mowing difficult. 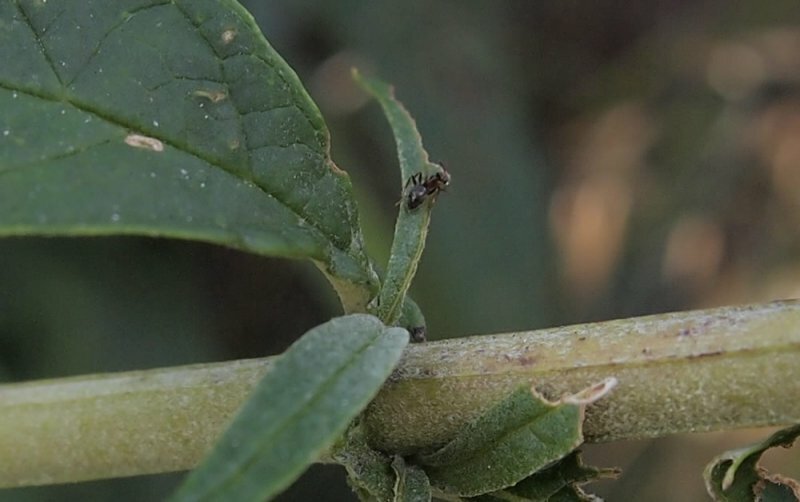 Ants are often found on plants with aphids, scale insects and mealybugs. While the ants themselves don’t directly cause a problem for the plant, they are simply feeding on the honeydew produced by the pests (called ‘milking’ or ‘farming’ them), it can encourage the spread of the pests (by protecting them from predators such as ladybirds) and also provide a good food source to grow the ant colony. 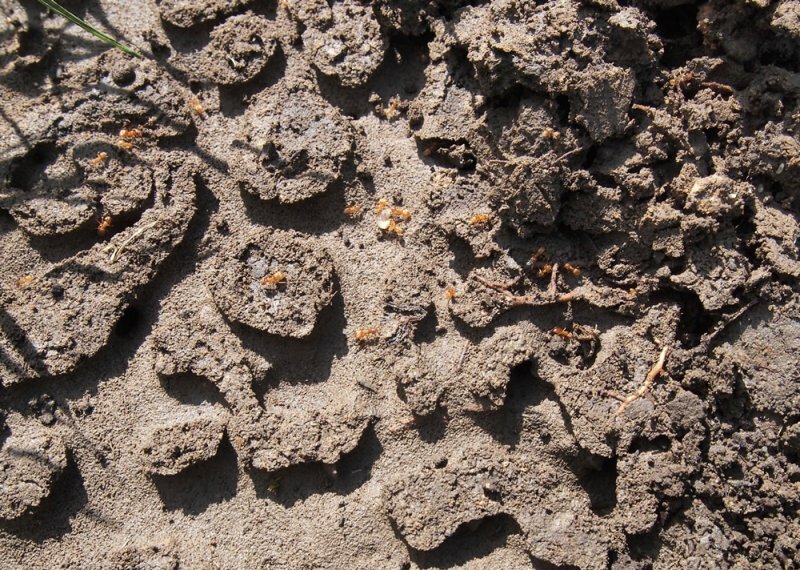 Ants tend to build their nests in the top layers of soil, under paving slabs, in walls, in compost heaps and anywhere else they can find a crevice or dig tunnels. You are also likely to find them on plants which are already infested by aphids, scale insects or mealybugs. Trees and glasshouses can be protected from ants using greasebands or other sticky barriers, to prevent them gaining access. This is also a useful indicator of whether you have an increasing ant problem, so regularly check the number you have caught. It’s difficult to get rid of an ant infestation permanently, as they will usually return to the site of a previous colony. Generally it’s easier to simply live with the ants (and perhaps even learn to enjoy the amazing habits and teamwork of a colony), but if plants are being damaged or your house has been invaded, then there are steps you can take. Pouring boiling water into the nests and the ants’ pathways leading to and from it can deter them, although this should be done with care near plants as roots can be damaged by this treatment. You could have a go at digging up the nest, but these often extend far beyond what the surface structure suggests. Alternatively, chemical controls (such as dusts and sprays) are available to treat the nest, although these are often only licensed for use near buildings rather than for general garden use. They are mainly synthetic pyrethroid based insecticides. If the nest is inaccessible then you can use dust or baits (which usually contain a sugar solution laced with an insecticide) in the areas where you have seen the ants, so the workers will (hopefully!) carry particles of the poison back to the nest. Renew the baits or dust regularly until you are sure that the ants are no longer visiting that area. 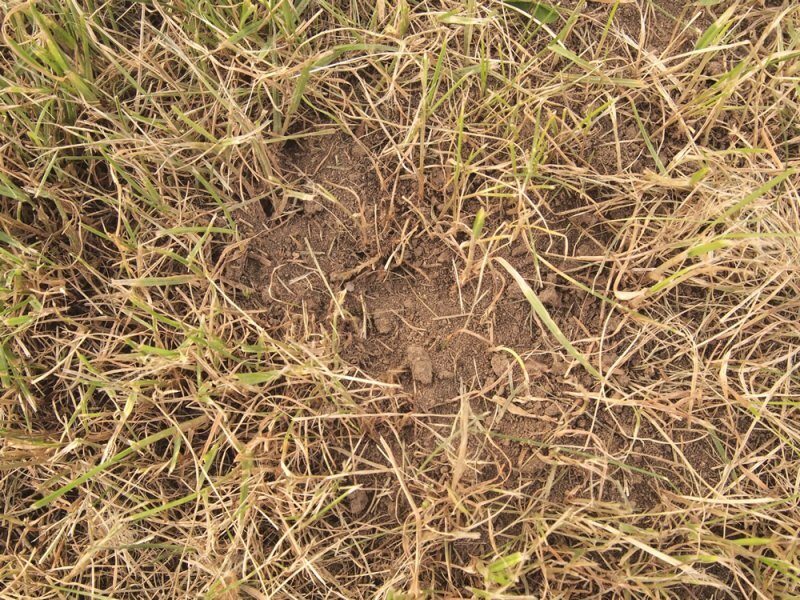 A biological control is available to deal with ant nests in lawns and borders. This pathogenic nematode, Steinernema feltiae, is a microscopic, worm-like creature which is watered into the soil. It burrows into the ant larvae and releases bacteria which will kill the larvae. If the nest building activities have caused fine soil to be deposited on your lawn then wait for a dry day and brush this to scatter the soil before you mow, otherwise you’ll be left with a ’smear’ which will stifle the growth of your grass. 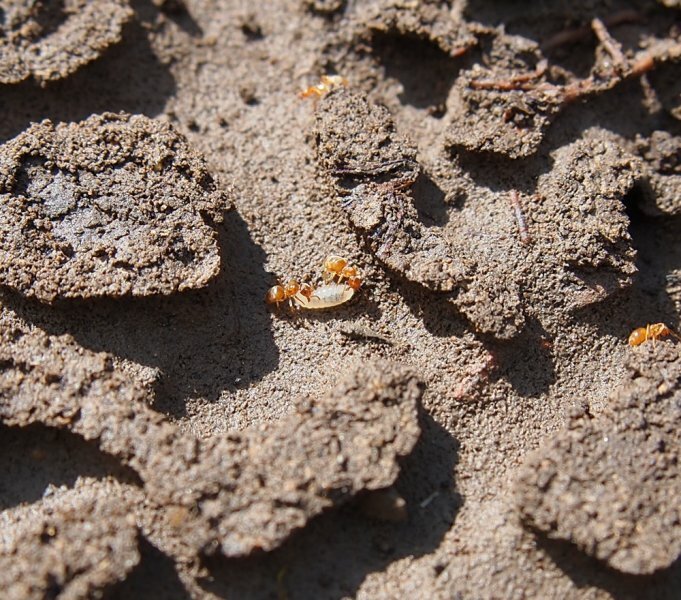 None of these solutions will work permanently as ants will usually re-populate an old nest site, so you may need to repeat them regularly over the course of each summer to minimise the ant numbers. Ants are used in some parts of the world as food, medicine and rituals. They can help to control some pests and their digging (when it isn’t damaging plant roots) aerates the soil. They are also the subject of much scientific research, due to their fascinating co-operative, communicative and learning abilities. Some ants (mainly those considered to be ‘red ants’) can sting humans, but for most people this is only a very mild sting.